Dinner Tonight? Ain’t Nobody Got Time For That! Never fear, I have a secret weapon that will save you time, won’t bust your wallet or your belt, and will taste pretty damn good too. Rotisserie Chicken to the rescue! Rotisserie chicken can be found at almost every grocery store, and even at convenience stores and gas stations these days. We all know how healthy chicken is, and cooking it tends to be the longest and hardest part of the meal. RC takes all that work from you, and puts it back into your energy and time bank. Score. Check out the following three awesome recipes that your whole family can enjoy, and they will save you a ton of time! In large bowl, stir together chicken, barbecue sauce, corn, tomatoes, and lime juice. Just before serving tacos, place stack of tortillas between paper towels on microwave-safe plate; heat in microwave on High 10 to 15 seconds to warm. To serve, divide lettuce and chicken mixture among tortillas; fold over to eat out of hand. Serve each with a dollop of sour cream. In large bowl, gently whisk together peanut butter, soy sauce, vinegar, oil, and garlic. Add chicken and red pepper, tossing to combine. Set aside. Cook pasta as label directs. While pasta cooks, cut cucumber in half lengthwise and thinly slice into half-moons. Reserve 1/2 cup cooking water. Drain pasta. Rinse with cold water; drain well. Add pasta and cucumber to bowl with chicken mixture. Toss until well coated. Garnish with cilantro. Serve with Sriracha, if desired. In 2-quart saucepan, cook bacon over medium heat 5 to 6 minutes or until browned. With tongs or slotted spoon, transfer bacon to paper towels to drain. Discard all but 1 tablespoon bacon drippings from saucepan. With wire whisk, add vinegar, Dijon, oil, salt, and pepper to drippings in saucepan and heat to boiling over medium heat. Remove from heat. Place romaine in large serving bowl. Pour hot dressing over romaine; toss until coated. 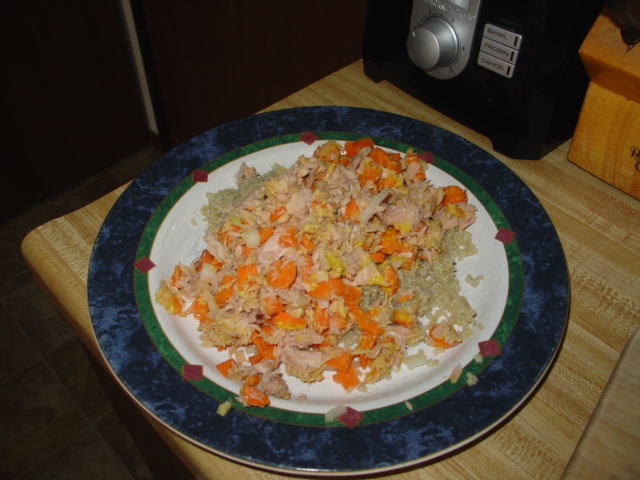 Add chicken and toss until well mixed. Crumble bacon; sprinkle over salad. First things first, I want to note that yes, I did not do a full 7 days of eating, but I can promise that I had plenty of food left at the end of day 6 to make it through one more day. The reason I did not complete the final day was because unfortunately I came down with Strep Throat and was not able to eat much the last 2 days. And in the end, I only lost 1 pound. The biggest key in saving time when making these meals is BULK PREP. Take advantage of time that you do have to make large batches of rice, beans, quinoa, oats, etc…which will last you through out the week and can be eaten hot or cold. Maybe I’ll blog one of MY “normal” eating days just to compare…once I’m back to 100%. Unfortunately, I have come down with a wicked cold, possibly the flu. I woke up this morning with an even worse sore throat. Since this my last day, I will stick it out an finish it up. MY dinner last night was 2 tilapia filets, and 1 medium sweet potato. It was pretty basic prep. I just pan seared the filets and microwaved the sweet potato. Day 6 started pretty standard, nothing exciting here… 3 eggs, 1 cup veggies, 1/2 cup dry oats. In between breakfast and lunch, I got my 2 servings of fruit in. Had one banana at 10AM, and an orange after my workout around 1PM along with a half cup of low fat cottage cheese. On Friday, I ended up going back home for the weekend, but was stil able to eat according to my SNAP foods. Before hitting the road on Friday, I had 1 cup quinoa, and 1 cup red kidney beans. When I got home for dinner, we were actually having fish, brocoli and rice. Pretty standard meal for my family, and it just so happened that these were the same foods I’ve been exclusively using for the past week. I dont have a calorie count on my day since I was away from my computer and not able to enter my data into a program. I should take this moment to say, I have been using MyFitnessPal.com as my calorie counter. 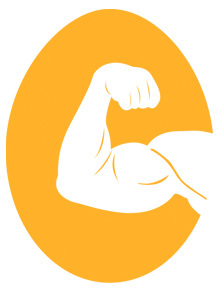 It is a great database for everything weight loss and nutrition, I highly recommend checking it out! 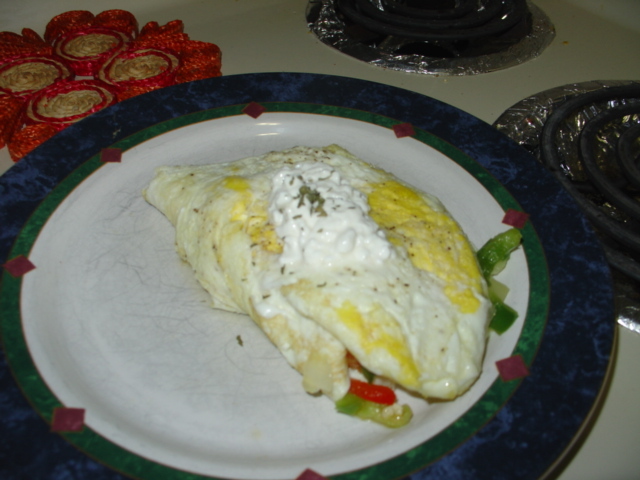 For BFast today I went with a little more creativity and made a 1 egg, 3 egg white omelet with 3/4 cup mixed veggies and 1/4 cup cottage cheese. 1/2 cup dry oats with 1/2 banana. The omelet was pretty simple to make, just sautéed up the veggies, set aside. Poured the egg and whites into the pan and cooked until solid, then folded it over the veggies and half of the cottage cheese, and put the rest on top. I ended the night going out with my fellow interns and ate probably about 2 cups of popcorn at the bar…along with a few brews. Dinner tonight was pretty big since I lifted legs today. Traditionally this is the day that I eat almost everything and everything that I want. The legs obviously contain the largest muscles in the body and thus demanding the most nutrients for adequate recovery/growth. I pretty much just threw a bunch of stuff on a plate and devoured it. 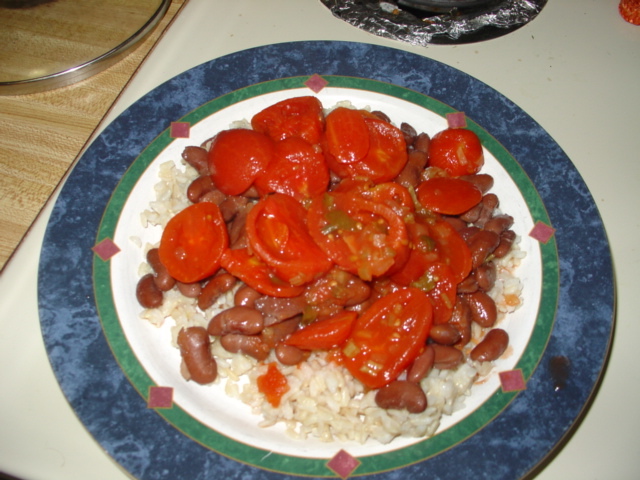 1 cup brown rice, 1 cup kidney beans, 1/2 cup stewed tomatoes and a side of 1 cup of cottage cheese. Pretty standard breakfast today, 2 eggs, 2 whites, 3/4 cup oats, 1 cup mixed veggies, and water. I figure no picture is needed since there already are 2 pics of the breakfast of champions on here. Eggs for Muscle, duh bro! So lunch was pretty interesting…since I was craving sushi, I decided to try and make “poor mans sushi” by rolling rice and tuna up in cooked spinach, after drying it out…this was an epic fail. 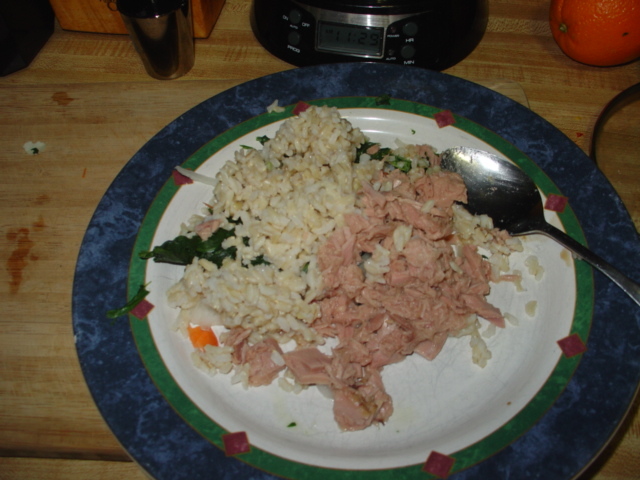 So it turned into “Mike’s Exploded Sushi Roll Supreme” 3/4 cup brown rice, 4 oz tuna, 1/2 cup spinach, 5 carrot sticks, few onion slices. 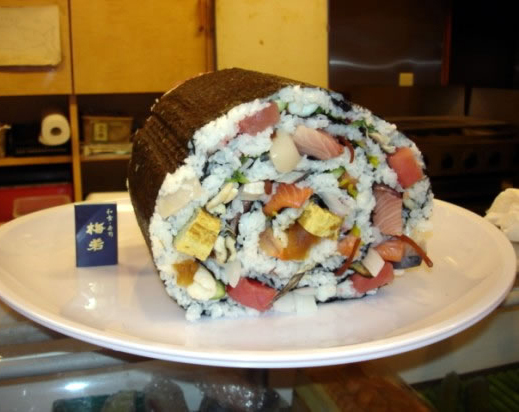 Oh, and it tasted nothing like sushi…go figure! 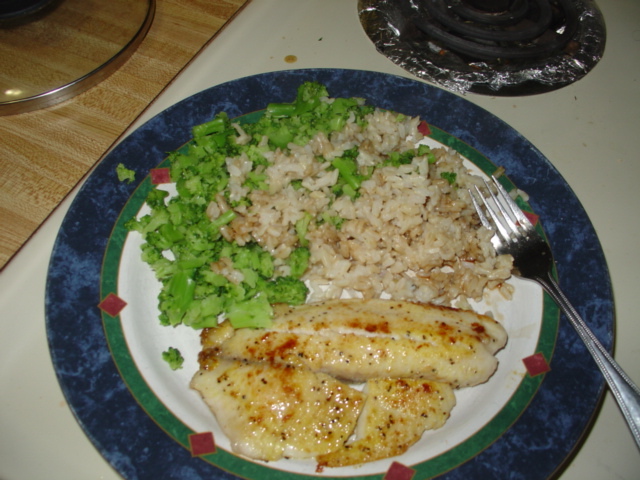 For dinner tonight I went with the classic tilapia, 1 cup brocoli, 1 cup brown rice (I prepared 2 cups of dry rice earlier). I decided to pan-sear the fish this time with a little garlic and lemon-pepper seasoning. Turned out a little better than the microwaved stuff from Monday. Even though these calories were much lower than what I wanted, and need, it makes sense because today was a non-lifting day for me. All I did was 30 minutes of light cardio, and a ton of sitting on my @$$… I never really was hungry, especially early in the day after that breakfast. It has been shown that eating most of you calories at breakfast will lead to lower consumption through out the day and successful weight loss. Along with that, eating eggs at breakfast has also been shown to lower hunger through out the day. These plus not doing my usual high intensity weight training, it makes sense that I really didn’t get hungry, even by eating about 1000 less calories than I am used to.